Motherhood manuals, Kay Mellor and the lottery, Working Class Feminism and Leanne Wood, new Plaid Cymru leader. Presented by Jenni Murray. Childcare manuals can leave women feeling inadequate and confused. So are they a help or a hindrance? Angela Davis and Penelope Leach discuss. Leanne Wood has been described as radical, feminist, republican and pro-independence. And The new leader of Plaid Cyrmu talks about her new role. 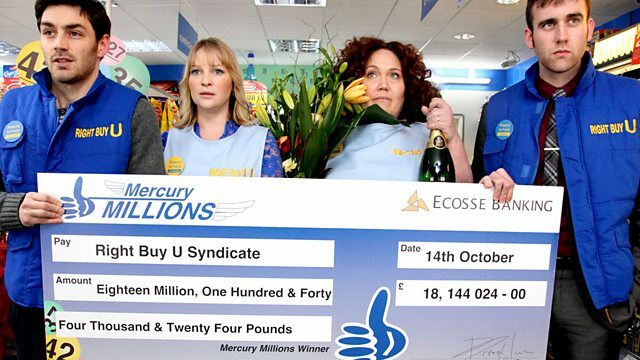 As a group of bus drivers from Corby celebrate their lottery win, Kay Mellor talks about her new drama about five workers at a cut-price supermarket in Leeds whose lives are turned upside down after their lottery win She is joined by lottery winner Elaine Thompson. According to new research childcare manuals can leave women feeling inadequate & confused. Jenni discusses with Penelope Leach and Angela Davis. Jenni talks to Leanne Wood who has just become the new leader of Plaid Cyrmu, and the first woman to hold the post in its 87 year history. Kay Mellor and "The Syndicate"
On the F-Word website working class women spoke about feeling excluded/patronised by the feminist movement. Jenni discusses with lecturer Liz Shorrocks, journalist Lynsey & writer Kay Mellor.